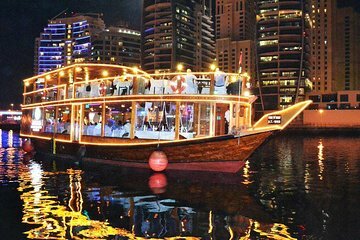 An Arabian ‘dhow’ boat dinner cruise on Dubai Creek is a quintessential Dubai experience. Pre-book to secure a trip on your evening of your choice, and save having to buy tickets and arrange return transport from your hotel when you’re in Dubai. You can then enjoy the cruise to the full: gliding by old Dubai’s illuminated sights; savoring dinner as you sail, and enjoying the on-board live entertainment.